and with this post, we'd like to tell you a little more about our upcoming quality efforts. We’re already committed to initiatives such as the Better Ads Standards and we continue to strive to create a clean and fair ad network. Continuing our work on quality in AdSense makes it more attractive to advertisers which in turn leads to better outcomes for our partners. 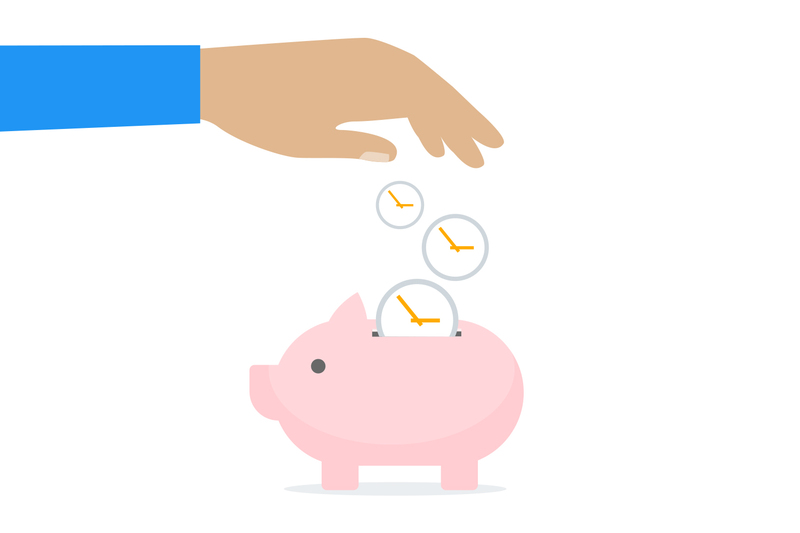 With this in mind, we're making some changes to the way you monetize new sites with AdSense. Before you can show ads on a new site, you now have to add the site to your AdSense account. Each new site will go through a verification process which checks that you own the domain or have the ability to modify its content. The process also reviews your site for compliance with the AdSense Program policies. After the checks are completed, your site will be marked as "Ready" and you can start showing ads. We're also renaming the My Sites tab to Sites and moving it further up the menu to make it easier to find. Any existing sites you’re monetizing should automatically appear in your sites list, accessed by clicking the new Sites tab. If you want to add more sites you’ll need to add them to this list. How will this impact partners? For the vast majority of AdSense users, the only change will be the new Sites tab. However, for some of you, we may ask for help to find the correct ad code when you add a new site. If we require your help, we’ll reach out through email and notify you when you sign in to AdSense. So don’t forget to make sure we have the correct email address for you and that your email preferences are up to date. 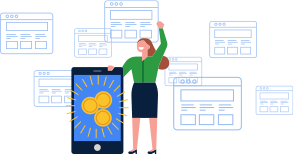 Over the last 15 years, AdSense has grown to support web publishers by connecting their audiences to advertisers, with the aim of keeping the web open and funding content creators. Earlier this month, we posted about the exciting future we have ahead of us and with this post, we'd like to tell you a little more about our upcoming quality efforts. 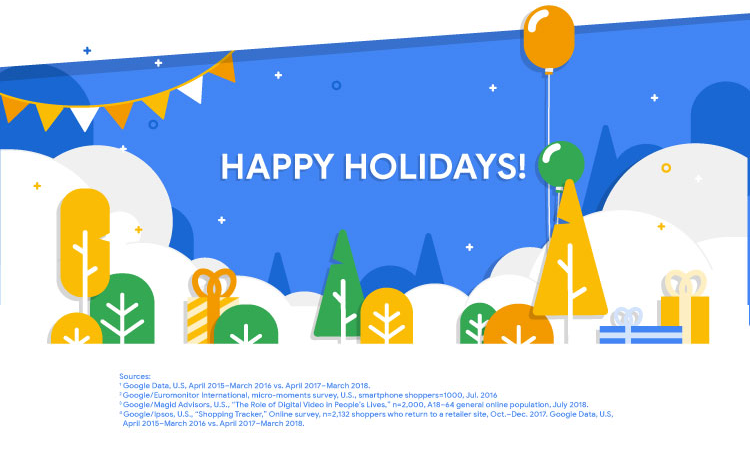 During the holiday season advertisers have their busiest time of the year as users search for gifts and celebration ideas. Increased demand in advertising space leads to growing RPMs and surges in traffic. Make the most out of this busy season by preparing your site and ads for increased activity. 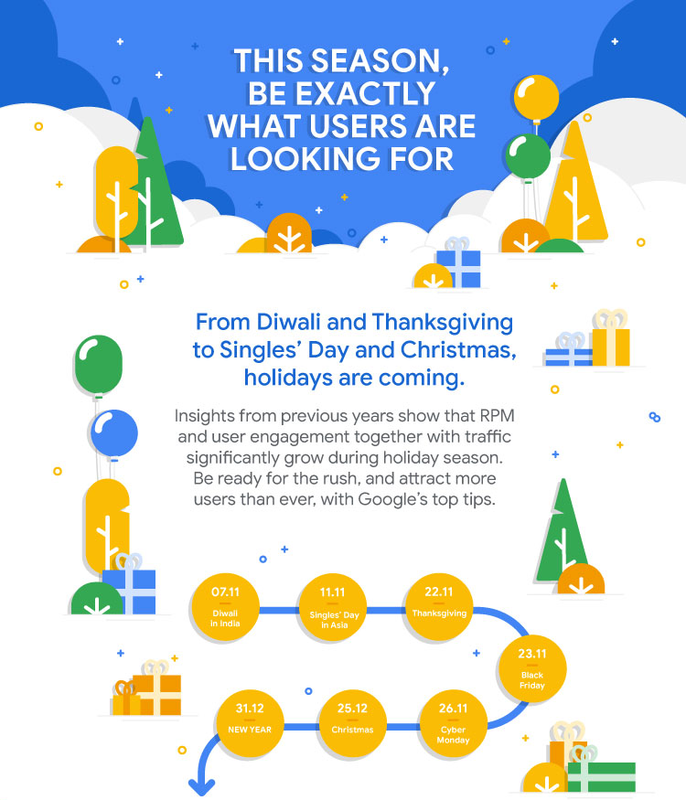 Take a look at our infographic with important tips on how to prepare for the holiday season. You can also download it with clickable links for desktop and mobile. powered by Google’s machine learning technology. We know you want to spend more time writing content and serving your users than managing ad tags and settings. We want that too. We’ve been investing heavily in understanding the best ways to increase user interest in ads, including when and what type of ads to show, while ensuring they complement your content and respect the experience of visitors to your site. Alongside these new capabilities, we’ll bring you the controls, reporting, and transparency you expect from AdSense to ensure we’re constantly meeting your needs along the way. Secondly, we know that creating great content can take time, but making that content profitable shouldn’t. We’re hard at work on a number of new assistive features that give you more insight into your performance when you’re ready to take action, a clearer understanding of how you’re doing relative to your peers and the industry, and improved navigation to help you get it all done faster. We want to save you time so you can focus on the things that matter most to your business, like creating great content for your audiences. 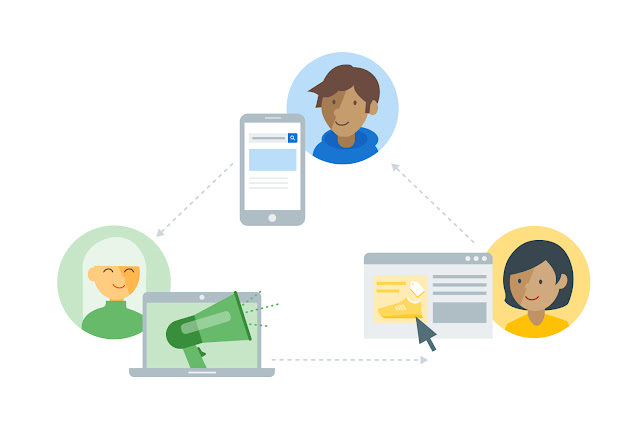 Thirdly, AdSense and Google are committed to advertising that works for everyone and playing our part to ensure the ads ecosystem supports the diverse needs of publishers, advertisers and consumers. We’ll continue to meet and exceed important industry standards on ads quality, including the Better Ads Standards, to make sure that great publishers who make engaging content are rewarded, while advertisers can continue to spend with confidence. As we launch into the next 15 years and with it deliver these new features, we may need your help to keep your account up to date. If we do, you’ll hear from us by email over the coming months. Don’t forget to make sure we have the correct email address for you and that your preferences are up to date. We’re just as excited about working with you now as we were when we launched 15 years ago. Thank you for being on the journey with us so far – here’s to another 15 years of partnership and shared success! Earlier this year, Google AdSense celebrated 15 years of partnering with digital content creators like you. A lot has changed since we started – new technology, new challenges, and new opportunities all driven by constantly changing user needs. A few things have endured though – the world has an insatiable appetite for great content and publishers like you remain the beating heart of the open web. Sharing in this mission with you, helping to create millions of sustainable content-first businesses on the web, keeps us going. While we look back fondly on the last 15 years, your stories inspire us to keep looking forward. There’s lots more to do to support you and set AdSense and our ecosystem up for success for the next 15 years. With that in mind, we’d like to share a preview of how we plan to help you grow and play our part in making advertising work for everyone. First up, smarter sizing, better ad placements and new formats powered by Google’s machine learning technology. We know you want to spend more time writing content and serving your users than managing ad tags and settings. We want that too. We’ve been investing heavily in understanding the best ways to increase user interest in ads, including when and what type of ads to show, while ensuring they complement your content and respect the experience of visitors to your site. 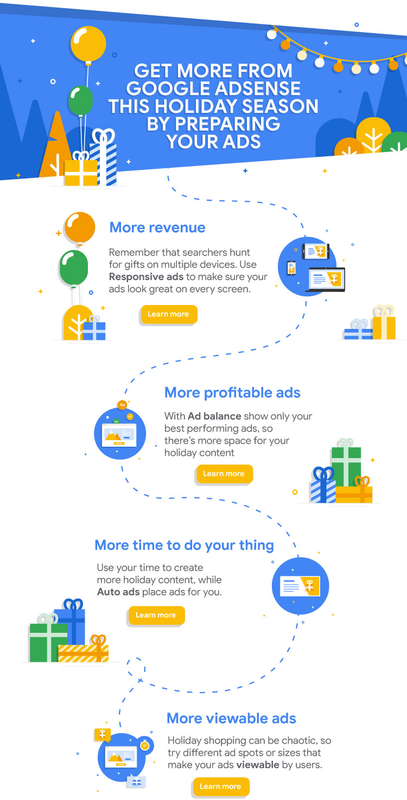 Alongside these new capabilities, we’ll bring you the controls, reporting, and transparency you expect from AdSense to ensure we’re constantly meeting your needs along the way.